I remember when I was around 15 years old in high school, sitting in the classroom during one of my very first chemistry lessons. The teacher — Mr. Altenberg — was discussing the structure and composition of atoms, having a small nucleus in the center and a few electrons swirling around it. He made a rough sketch of it on the blackboard. And at some point I interrupted him and I asked him: “Mr. Altenberg, that drawing looks a lot like our solar system. Isn’t it possible that our solar system is perhaps just an atom in a much larger structure in the universe?” Mr. Altenberg, certainly among one of the cooler teachers I’ve ever had, looked away, stared for a second, and then slightly to my surprise admitted that it was a possibility. But that was not the first time I had wondered about this. Much earlier during my childhood, while reading books on astronomy with pictures depicting our solar system, I remember always thinking that our solar system looked so much like an atom. It seemed so obvious to me, and I wondered if anyone else had the same thoughts I had because I had never seen that mentioned anywhere else. And I thought that if we could just zoom out of the universe enough, we might discover that we’re really living on an electron in a molecule inside a cell of a much larger living organism. Similarly, every cell in our body could be home to an infinite number of universes packed with electrons capable of supporting life just like our planet Earth. And as it turns out, research in the last 80 years shows that I wasn’t so crazy for thinking this after all. And neither was Mr. Altenberg. Looking at this image, you might say to yourself that there’s no way such a complex and organic looking pattern could be created using a simple mathematical formula. But the fact is that it was, and the cool thing about this is that we’re now finding that the same thing can be said about nature. When we look at the world we live in, we see complexity and diversity. And at first you wouldn’t expect such random and chaotic looking patterns to be defined by a mathematical formula. Take trees or mountains for example, or the way rivers branch out. And yet what Benoit Mandelbrot found is that even such seemingly random, chaotic and complex looking patterns can all be described using relatively simple mathematical equations. Simple equations that create a basic pattern but through many iterations produce complex and detailed looking structures. Today such equations are used to simulate nature in very realistic looking computer generated worlds. Users of 3D imaging software such as 3D Studio Max will be familiar with using fractals to simulate things like clouds or mountains. All of this is explored in detail in a documentary by PBS/NOVA titled “Fractals – Hunting the Hidden Dimension” (YouTube link) which I highly recommend checking out for a much more detailed understanding. 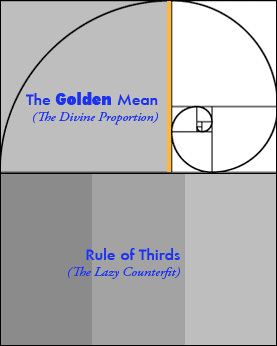 The golden ratio (Phi), for example, is a geometric relationship that is found everywhere in nature and appears to be a product of the basic equation that describes our universe. Just like you can look at the Mandelbrot fractal set and see similarities and relationships between pieces of the pattern everywhere, so too can you look at nature and see similarities and geometric relationships everywhere. The short video clip below titled “Nature by Numbers” which is available on YouTube does an excellent job at explaining this relationship visually. 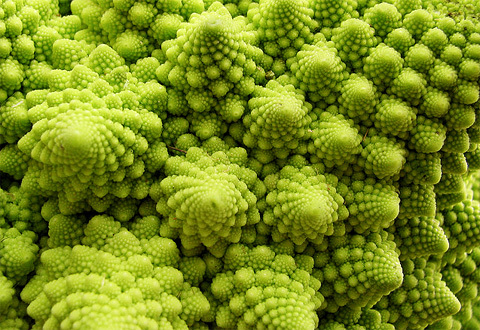 In the below image of a cauliflower you can not only see the golden ratio expressed in the spiral distribution, but you can also see the fractal nature of the structure with repeated self-similarity at various levels. That brings me to the Rule of Thirds. After a tremendous amount of research (I read a book) I learned that the rule of thirds may actually be just a lazy man’s sham. That’s right, I said it… a lazy sham! On the surface the rule of thirds doesn’t really make a ton of sense, I mean why would a composition broken up into three equal parts be innately more appealing than any other random spattering in a composition? Well what if I told you that nature actually does instinctively, and inexplicably seem to have a naturally occurring preference towards a specific ratio, a peculiar number, a divine ratio if you will? To find the real story behind the “rule of thirds” we need to go back in time, not to the renaissance, not to the Greeks, and not even to Adam nor Eve… even further. We need to go to the creation of the universe, why is that? Well I’ll tell you why. 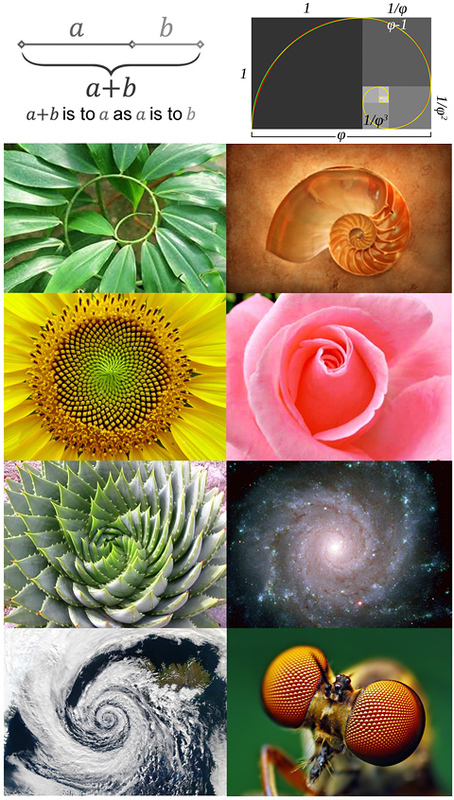 There is a number that determines how a sunflower’s seeds grow, it determines the path a hawk takes when diving at it’s prey, it is echoed in the breeding habits of rabbits and it even determines how the spirals in a spiral galaxy are laid out. It’s all very simple in it’s beauty and best of all, it’s all true. If you want to wrap your head around it further then I highly recommend the book The Golden Ratio by Mario Livio. As an aside, this reminds me of the time when I criticized Canon Inc. for not thinking about the rule of thirds when designing focus systems on their cameras. You would think that a serious camera manufacturer would pay attention to such natural and elementary rules of composition. The realization that nature — our entire universe — is a fractal, opens the door for us to new realizations and understandings about life and the world we live in. By applying this realization to various problems in science, we can develop better solutions much faster. An example of this is the exciting research that’s being done by Nassim Haramein, where he uses this understanding of fractals and geometric relationships in nature to develop his new unified fields theory. I highly recommend checking out the below presentation by Nassim, which will not only entertain you, but is guaranteed to blow your mind. Nassim Haramein’s paper titled “The Schwarzschild Proton” was accepted by a panel of 11 peer reviewers at the University of Liege in Belgium and won the best paper award in the fields of physics, quantum mechanics, relativity, field theory and gravitation. In my opinion Nassim could be the Albert Einstein of our time. What Nassim shows in his presentation is exactly what I always wondered during my childhood: That our universe may be a gigantic, seemingly infinite, fractal structure where you can zoom in and out as much as you want and continue to be able to find the whole expressed even in the tiniest parts over and over again. And I said “seemingly infinite” because even though our universe may appear to be infinitely large, and we may be able to zoom in and out infinitely, it may still occupy a finite amount of space and thus be finite. If you can’t imagine how this is possible then don’t worry; in the beginning of the above linked presentation, Nassim explains how a finite space can contain or encapsulate an infinite space. Interestingly this same illustration also shows how we can all be individuals living in this universe and still be connected to each other and be a part of a whole. Single individuated pieces of consciousness that are part of a much larger consciousness, as physicist Thomas Warren Campbell explains in his book trilogy “My Big TOE (Theory of Everything)” which I also highly recommend as it fits in nicely with Nassim’s work. What this means is that the spiritual teachers from the past were always right when they said that we all contain the universe or infinite possibilities within ourselves, and if we want to find answers we have to look within ourselves. Indeed each and every one of the atoms in our body enfold the entire universe within them. And now we’ve come to a point where this isn’t just theoretical metaphysical talk, but hard scientific fact as Nassim explains in his presentation. For years science has been trying to find a single theory of everything — one mathematical equation that could describe the entire universe. But their approach is far too complex and based on the wrong assumptions, and it’s no wonder that string theory keeps them busy for so long without any kind of significant progress. Perhaps they need to go back to the basics and instead of describing the complexity, describe the simplicity that lies at the basis of all the complexity we see around us. Instead of looking at our whole universe, we need to go back and look at the elementary structure that lies at the base. Once we *really* understand that, it will be easier to understand how it scales up to form the more complex structures we see around us. It’s like researching how a single cell in the human body functions, in order to understand the workings of our body as a whole. 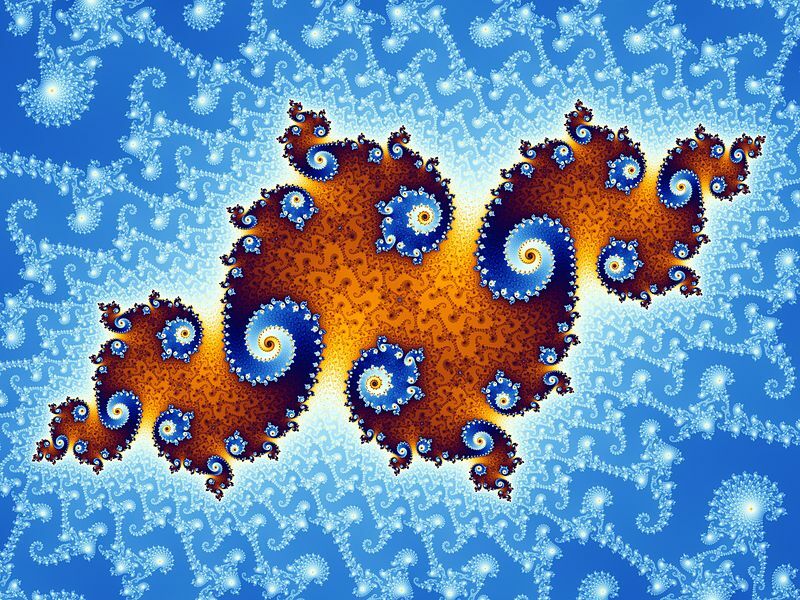 Because like artists and philosophers from hundreds of years ago have known (and Leonardo da Vinci was one of them), even the human body is based on a fractal design. However, all of the above gets even more exciting when you realize that the fractal nature of our universe is one of the defining characteristics of a hologram. Research in the last 80 years increasingly points to the fact that we might be living in a holographic reality and the fractal nature of our reality is just one evidence of this. Certainly Nassim Haramein’s research would support such a concept and the fact that our universe may be a virtual holographic reality is the basis of Thomas Campbell’s research as detailed in his book trilogy “My Big TOE.” David Icke has also been talking about this for years, and in his book titled “Infinite Love is the only Truth: Everything Else is Illusion” he also spends a lot of time on this subject. But the book I would really recommend you check out is “The Holographic Universe: The Revolutionary Theory of Reality” by Michael Talbot. To make a hologram, the object to be photographed is first bathed in the light of a laser beam. Then a second laser beam is bounced off the reflected light of the first and the resulting interference pattern (the area where the two laser beams commingle) is captured on film. When the film is developed, it looks like a meaningless swirl of light and dark lines. But as soon as the developed film is illuminated by another laser beam, a three-dimensional image of the original object appears. The three-dimensionality of such images is not the only remarkable characteristic of holograms. 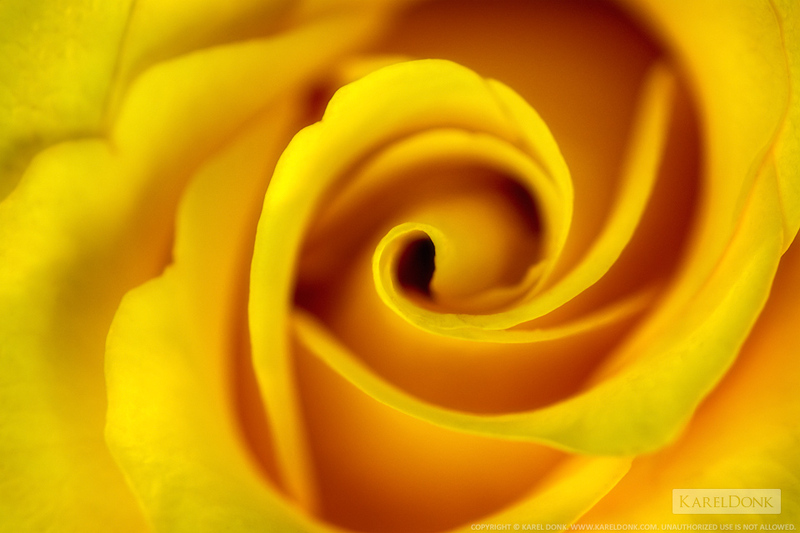 If a hologram of a rose is cut in half and then illuminated by a laser, each half will still be found to contain the entire image of the rose. Indeed, even if the halves are divided again, each snippet of film will always be found to contain a smaller but intact version of the original image. Unlike normal photographs, every part of a hologram contains all the information possessed by the whole. While it is true that if you would cut a hologram into a few pieces, you could still view the entire image by illuminating a single piece, the resulting projection would be of a lower resolution. Talbot mentions in his book that the projection will get hazier and smaller. So it’s important to understand that although the whole image can be found on each individual piece, it’s of a much lower resolution compared to the original bigger piece because of less detailed information being available. This brings me back to the point I made earlier that if we want to understand our reality, it would perhaps be smarter to look at the elementary structure that lies at the base, which is much simpler, and then try to work out how that scales up. In the example of the hologram, a small piece of it contains much less information compared to the whole, but is still a reflection of the whole. Thus it may be an easier way to understand the whole. If instead we try to understand our universe at the macro level, it may be far too complex to get an accurate grasp of it and theories we work out based on that may not hold true as we scale up or down. This is exactly what scientists are now seeing; Newton’s laws do not hold up in the world of small particles. And that’s because they are grossly incomplete and inaccurate and cannot describe reality in general; they work only for a very small subset of reality. It’s no coincidence that the science related to small particles — quantum mechanics — is found to be able to give us a much better understanding of our reality. I had already mentioned that the human body also has a fractal design and this is explained by the fact that the human body is also a hologram, itself existing in a much larger hologram we call our universe. Just like in a hologram, you can find the whole human body in each part of the body too. Not only that, but everything is also fundamentally interconnected and part of the larger whole. Acupuncture for example is based on this principle. In the image below you can see the acupuncture pressure points on the feet and the ear which are connected to various other parts of the body. And of course we know that each individual cell in our body contains it’s own copy of our DNA which contains all the information to describe the whole body. It’s mind-blowing to realize that when you look in the mirror and see the complexity of your body in front of you, all of that information is enfolded in a small strand of DNA in a single cell in your body. And just like with a fractal pattern, through billions of iterations this small piece of information develops into the complexity that is you. In fact the very way we procreate is of a fractal nature. As for Pribram, by the 1970s enough evidence had accumulated to convince him his theory was correct. […] The question that began to bother him was, If the picture of reality in our brains is not a picture at all but a hologram, what is it a hologram of? Pribram realized that if the holographic brain model was taken to its logical conclusions, it opened the door on the possibility that objective reality—the world of coffee cups, mountain vistas, elm trees, and table lamps—might not even exist, or at least not exist in the way we believe it exists. Was it possible, he wondered, that what the mystics had been saying for centuries was true, reality was maya, an illusion, and what was out there was really a vast, resonating symphony of wave forms, a “frequency domain” that was transformed into the world as we know it only after it entered our senses? This striking new picture of reality, the synthesis of Bohm and Pribram’s views, has come to be called the holographic paradigm, and although many scientists have greeted it with skepticism, it has galvanized others. A small but growing group of researchers believe it may be the most accurate model of reality science has arrived at thus far. More than that, some believe it may solve some mysteries that have never before been explainable by science and even establish the paranormal as a part of nature. Numerous researchers, including Bohm and Pribram, have noted that many para-psychological phenomena become much more understandable in terms of the holographic paradigm. In a universe in which individual brains are actually indivisible portions of the greater hologram and everything is infinitely interconnected, telepathy may merely be the accessing of the holographic level. Thought processes and quantum systems are analogous in that they cannot be analyzed too much in terms of distinct elements, because the intrinsic nature of each element is not a property existing separately from and independently of other elements, but is instead a property that arises partially from its relation with other elements. Indeed, Bohm believes that our almost universal tendency to fragment the world and ignore the dynamic interconnectedness of all things is responsible for many of our problems, not only in science but in our lives and our society as well. For instance, we believe we can extract the valuable parts of the earth without affecting the whole. We believe it is possible to treat parts of our body and not be concerned with the whole. We believe we can deal with various problems in our society, such as crime, poverty, and drug addiction, without addressing the problems in our society as a whole, and so on. In his writings Bohm argues passionately that our current way of fragmenting the world into parts not only doesn’t work, but may even lead to our extinction. There’s absolutely no doubt in my mind that fundamentally understanding the fractal nature of our universe holds great promises for our future. Once we understand that we’re all one, that all things are infinitely interrelated and influencing each other — and this understanding is now backed by science — we may start to work towards a global society where this scientific fact is reflected everywhere throughout. •The human species is likely to go extinct before reaching a “posthuman” stage. •Any posthuman civilization is very unlikely to run a significant number of simulations of its evolutionary history. •We are almost certainly living in a computer simulation. Physicists say they may have evidence that the universe is a computer simulation. How? They made a computer simulation of the universe. And it looks sort of like us. A long-proposed thought experiment, put forward by both philosophers and popular culture, points out that any civilisation of sufficient size and intelligence would eventually create a simulation universe if such a thing were possible. And since there would therefore be many more simulations (within simulations, within simulations) than real universes, it is therefore more likely than not that our world is artificial. We are living in a giant hologram, and everything we see around us is merely a projection of a two-dimensional surface.This is the bizarre theory put forward in 1997 by physicist Juan Maldacena, who was able to prove its existence in equations that only partially explain our universe. Now researchers in Austria have, for the first time, been able to show how this strange holographic principle can also work in a more realistic model of our cosmos. In essence, the principle claims that data containing a description of 3D object – such as the device you’re reading this on – could be hidden in a region of this flattened, ‘real’ version of the universe. Maldacena came to this conclusion when he discovered that mathematical descriptions of the universe actually require one fewer dimension than it seems. But up until now, this principle has only been studied in something known as ‘curved anti-de-sitter spaces’ – or exotic spaces with negative curvature. Scientists came up with these spaces as way to combine describing gravity in a three-dimensional setting while predicting quantum particles in two spatial dimensions. Around 40 years ago Marko Rodin discovered a basic mathematical principle that appears to underlie everything in the universe. He called it Vortex Based Mathematics, and it appears that much of the ancient wisdom and symbolism (All Seeing Eye, sacred geometry etc.) comes from this basic mathematical understanding of our reality. I highly recommend watching the below presentation by Randy Powell for an introduction. Leonard Susskind of the Stanford Institute for Theoretical Physics discusses the indestructability of information and the nature of black holes in a lecture entitled “The World As Hologram”. This entry was published on Sunday, June 9th, 2013 at 6:01 pm by Karel Donk and is filed under Books Design Science Takes on Life fractal universe fractals golden ratio holographic reality holographic universe rule of thirds sacred geometry. You can use the permanent link to bookmark and/or share it. I have since this days, never fully understudd the hype or the talk about Realitvity, but untill reasently, I havent writen or comented with anything New, ist all 80 stuff and stil this is not known, as the fractal math and the fractal nature of everything I belived it was COMON knowlege, but there I was wrong. This is so far the best I have read, and the equation is like a butterlfy, poetry in “motion”. And I also think, you nailed it. The feedback loope is the sole instigater, and whats driving it, makes it happen, is the next stepp, but that one is a tuff one to answer, so God can do for so long. Thanks, and you’re right, not much progress has been made. But this is because the scientific establishment stubbornly holds onto their flawed and outdated views. Talbot mentions this in his book and so does Campbell. But fortunately we have mavericks like Haramein, Bohm and Pribram and others who have the courage to deviate from the rest and come up with unique new angles. There are two conflicting theories of the Universe・ one being that it is structured like a hologram, the other that it is structured like a fractal. Here we suggest that both theories are true, and we can resolve the issue by adopting the dual aspect viewpoint of Plato-Leibniz that there are two simultaneous universes that correspond to each other, like the two side of a coin. One is the universe of Plato’s Mind (the One), the other is Leibniz’s universe of Monads (the Many), where the One creates, perceives and controls the Many. According to these two aspects, conceptually the universe is a hologram, but physically it is a fractal. Both theories envision an infinity in a speck. This can be so if the speck is Leibniz’s monad, in which the infinity on the mental side is a hologram, and in which the infinity of the physical side is a fractal. In the other camp, there is a fair amount of evidence that the universe is structured like a fractal, but little that it is structured holographically, other than some thought experiments with black holes. There is some conflcting comment that the fractal stucture begins to disappear at very large scales, but that may be due to the effect of fitting a large fractal into a finite universe, and also perhaps due to Hubble’s “red shift”. 1) Leibniz’s fractal aspect of the outside or physical universe (the Many, Monads). There is some evidence from black hole thought experiments and the Northern Lights, that the physical world of spacetime is holographic, but the bulk of the evidence comes Pribram’s studies of the brain, as explicated by Michael Talbot’s book “The Holographic Universe”, which seems to have been better titled as “The Holographic Mind”; Leibniz envisioned such a scheme in his Monadology: So it would appear that the universe is conceptually like a hologram but physically like a fractal. 2) Leibniz’s simultaneous holographic aspect of the inside or mental universe (the One, Mind). Thus the mental or inside is a hologram while the outside or physical is fractal in nature. Each physical body is represented by a monad, which are created at the beginning of the universe, and since monads are non-interacting individuals, each monad is a separate fractal. Both structural theories view an infinity in a speck. Which is reconciled if the speck is Leibniz’s monad, in which the infinity on the mental side is a hologram, and in which the infinity of the physical side is a fractal. I am just going to let this rest as an hypothesis, but it does point out the urgent need for physicists to study the world of Plato-Leibniz (see my site below), where Mind appears to see the world differently than the eye. Just so you know somebody read your post. Excellent! Just happened upon it. I too had the same idea; that the Solar System resembles an atom. 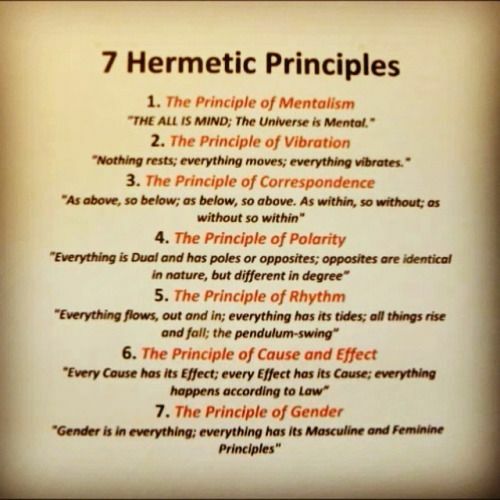 In the philosophy of Hermeticism, this is something referred to as the Law Of Correspondence. It refers to the fractal nature of all creation. “As Above, So Below. As Within, So Without.” That which is in the micro world resembles that of the macro, and so on, and so on. Rules 4,5,6 & 7 are a little too binary for me. True, we live in a highly dualistic reality; hot and cold, fast or slow, male female, good evil, but try to imagine a third point, a harmony between good and evil, and then a fourth and fifth. Speaking of binary, our planet is an electron spinning around in our solar atom. The Earth has an electrical charge with a magnetic poles. Our solar atom resembles a torus but anyway, for the atoms that make our plane of reality orbit around so many times in a million millionth of one of our seconds that they appear to form a solid shell. Ten billion centuries pass in for what to us is a fraction of a second. And the cosmic membrane of some cellular organism of which our galaxy is a fragment, has passed one ten zillionth of micro second during all of Earth’s existence. As above so below, infinity in both directions. THERE ARE EVIL ENTITIES WHO USE HUMAN BODIES, KNOWN AS WOLVES IN SHEEPS CLOTHING. I would like your permission to narrate your Blog post on “The Holographic & Fractal Universe” Also “Exponential Growth In The Fractal Universe” and share it on YouTube. All credits would be to you and I would not monetize the channel and a link to this blog would be provided in the description below said video upload. I would create a new YouTube Channel specifically for Scientific Theory and interesting Science related things in general if permitted to narrate these blog posts. Thank you in advance for your consideration either way. You have my permission if you provide credits also in the video (apart from the description below it) with a link to the original articles on my blog. You may also monetize your work and channel and keep everything you make from it (you don’t have to pay me anything). I’d appreciate it if you shared a link to your videos here as well.